Instead of spending thousands of dollars and having to finance your hair reduction needs at a salon, you can purchase a treatment system for home use. These machines cost a few hundred dollars, and allow you to drastically reduce the production of hair on your entire body (depending on the system you choose). For this review, we’re actually covering the LumaRx IPL mini, which is meant to produce precision results in areas like the face, underarms, bikini line and other small areas that need treatment. The LumaRx Mini gives users a focused treatment window that will allow you to zap one area with pinpoint accuracy. 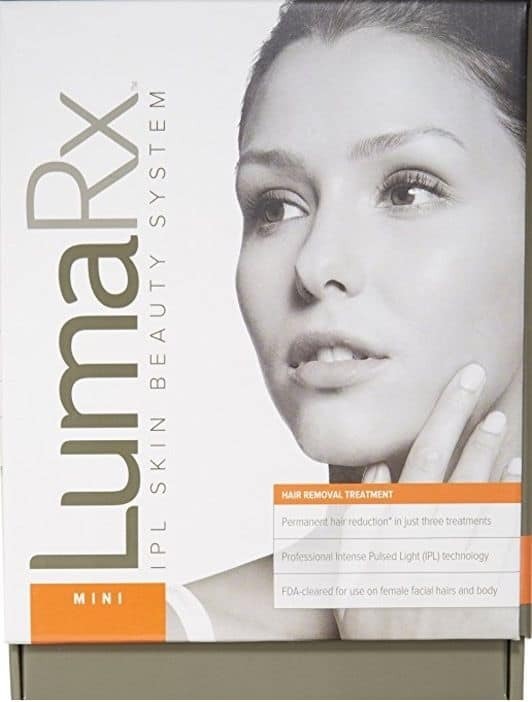 This is what makes the LumaRx such a great hair removal system for the face and other tiny areas that need work. This mini device wouldn’t work very well for large areas like the legs or arms. The full body device would be needed for those larger areas. With IPL technology, you get a safe, effective treatment that’s been on the market for over 20 years. It was one of the first companies to receive FDA clearance for IPL use at home. All companies have to receive clearance through the FDA, but they were the first. One of the biggest safety mechanisms in place is that the pulse of light won’t happen unless the device’s treatment window is in contact with the skin. The IPL, or Intense Pulsed Light, shoots light into the follicle, which heats the follicle and causes it to deaden. It is able to be absorbed by the darkness of the hair’s pigment. That’s why it doesn’t work on dark skin with little contrast between skin and hair color. In fact, when there’s little contrast, the light could cause a burning across the skin itself. Before removing the unit from the box, it’s important to prepare the area by shaving and cleaning. You want a smooth surface to be able to skim the device across, but you also don’t want hair poking up through the skin. The light will break off the hair without getting deep under the skin. Test your skin to ensure that it is suitable for use. The unit can be placed on your skin where it’ll check your tone for suitability. Once that is done, the unit will be unlocked for use. Choose the energy level you want for hair removal. It’s recommended that you choose a medium setting for the first time. In some cases, you’ll never have to advance past medium, but you don’t want to start on high. As you start using it on your skin, make sure you’re moving in a grid pattern and overlap as you move, so you don’t miss any areas of the body part you’re treating. Always use safety glasses to protect your eyes from the flash. There are so many videos out there with women not using protective eyewear, but you don’t want to ruin your vision by having the light penetrate your eyes. It’s permanent, irreversible damage. Within the first few months, the person should be using the device once every two weeks. In the first few months, there should be a noticeable difference in the regrowth of hair. What many people don’t understand is that the hair on your body grows in cycles. What’s visible now isn’t the same hair you’ll see in a few months. This is why there has to be a few months of treatments before real results will be seen. It doesn’t help to treat the area more than once or twice a month. When you take a salon product out of the salon, you don’t get the education you would with salon technicians. For example, not everyone knows about the life cycle of the hair. They’ll complain about hair growing back, but it’s not the same hair. They might have patchy results, which could be because they tried to use a mini device on larger areas. While reviews are important to the process, and valuable for the most part, when it comes to hair removal devices, it’s hard to tell what the person might have been doing incorrectly. 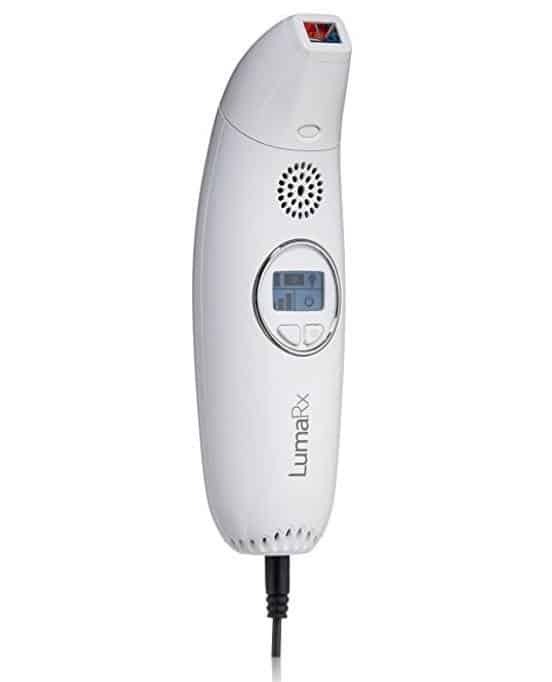 The LumaRx IPL Hair Removal Mini is a great device for anyone who doesn’t need to do large patches on their body. Some women only need to worry about their facial hair or bikini line. The slim, ergonomic device makes it easy to reach areas that would normally be difficult.